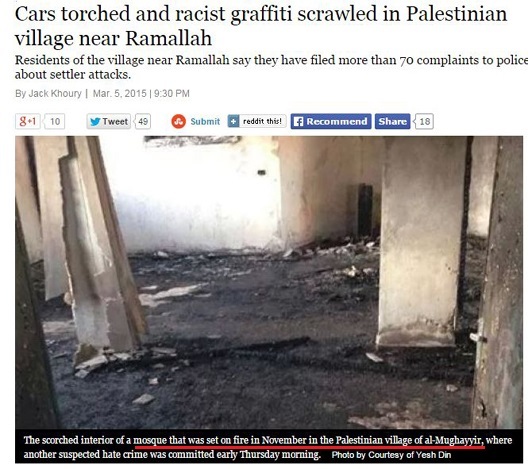 Months after Haaretz initially reported that an Israeli investigation concluded that the Nov. 11, 2014 fire in the mosque of the West Bank village of al-Mughayyir was the result of an electrical malfunction, and not an arson attack and had been widely reported, the Israeli daily again reported that the mosque had been torched. 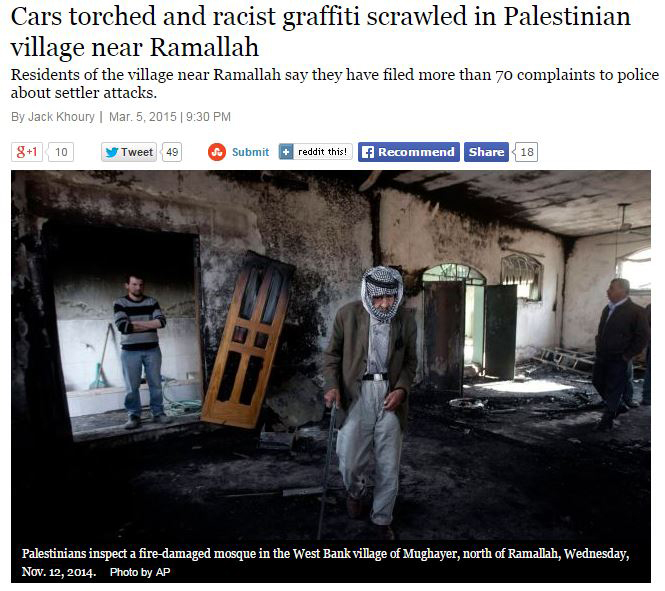 Last year, al-Mughayyir’s mosque was torched and spray-painted with racist slogans. Villagers said the arson caused major damage to the first floor and minor damage to the second floor. The scorched interior of a mosque that was set on fire in November in the Palestinian village of al-Mughayyir, where another suspected hate crime was committed early Thursday morning. Haaretz previously clarified this same unfounded claim last on Jan. 4, 2015. Other media outlets which have corrected, making clear that an Israeli investigation found that the fire was caused by an electrical problem, and not arson, include The New York Times (below)and the Associated Press. In response to communication from CAMERA’s Israel office, Haaretz editors deleted the paragraph from Friday’s online article which had claimed that the mosque was torched and spray-painted with racist slogans last year. Haaretz editors, however, did not act transparently in that they failed to note that the article and caption had been corrected. CAMERA continues to urge Haaretz append a correction online and to run a correction in tomorrow’s print edition.